A campfire dutch oven is a great way to expand your "cooking with fire" repertoire. A dutch oven can be used in in a fireplace, on a campfire, a fire pit or even right on your grill. They allow you to sauté, boil, stew and braise like you would on your oven but right over your open fire! In fact there are different types of campfire dutch oven. The most common type is a large cast iron pot with a heavy, tight-fitting lid. If these have a metal handle they can be hung over a fire pit or campfire from a crane or campfire tripod. Alternatively, they can be hung over your fireplace fire by a fireplace crane. Some specially made dutch ovens and skillets, such as the one pictured above and below, are made with legs. These legs are specifically designed for use with an open fire, even if you don't have a tripod. These usually have a concave lid as well. The reason for the legs and lid are that you use your hot embers or coals to heat the pot. You use a shovel make a small pile of hot embers aside your fire or fire pit. Then you simply lower the dutch oven or fireplace skillet on top of it. Finally, once your food is inside the pot and the lid is closed, you shovel some more hot coals on the lid to heat the pot thoroughly from top and bottom! You can keep adding hot coals as needed to keep your heat up through the cooking process. What is the Advantage of Dutch Oven Cooking? The heavy cast iron of most ovens retains and distributes heat beautifully. This is perfect for slow cooking a whole bunch of foods that would be hard to cook on an open fire otherwise. Soups, stews, braised meats and even sauteed foods can be done right in the big pot or fireplace skillet. In effect, you are cooking just like you would with a big pot on your stovetop or in your oven. 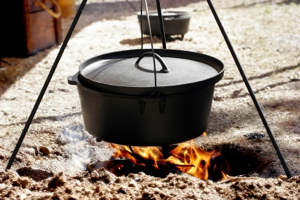 Where Can You Find a Campfire Dutch Oven or Fireplace Skillet? Lodge® Cast Iron makes a great assortment of cast iron cookware and supplies. They have a large line of campfire ovens complete with feet and heavy duty metal handles for hanging. 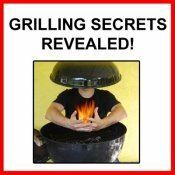 SpitJack.com is a great online retailer who carried a wide assortment of fireplace cooking and outdoor cooking equipment. The cool fireplace skillet with legs above is available at their online shop. Check out your local camping supply shops and specialty cooking retailers. Many will carry heavy duty cast iron cookware including campfire ovens and skillets. 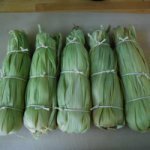 One of the best places I know to buy supplies for cooking with fire is SpitJack.com. Besides being one of the best options for fireplace cooking supplies (fireplace grills, rotisseries, cranes, long-handled roasters, etc. ), they have a uniquely chosen stock of other great accessories. Their own fire pit rotisseries for pig and lamb roasting are top notch and sturdy. They also have fire pits, firewood storage and splitting supplies and more! Check them out! Done with the Campfire Dutch Oven page? 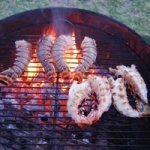 Return to the Campfire Cooking page. 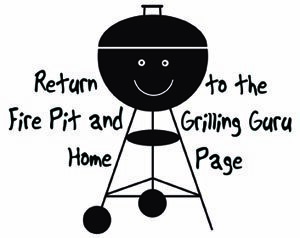 Or return to the Fireplace Cooking page.